Shifts in the current administration have created uncertainty and confusion in many immigrant communities. While so far nothing has changed related to eligibility for food assistance benefits, fear has led many families to become more hesitant in seeking vital anti-hunger resources and/or voluntarily withdraw from government food assistance programs. In an effort to provide individuals and organizations the latest information and resources, the San Diego Hunger Coalition has reached out to local and national immigration organization including the ACLU of San Diego and Imperial Counties to pull together information that can be shared with nonprofits and their clients across food assistance programming. 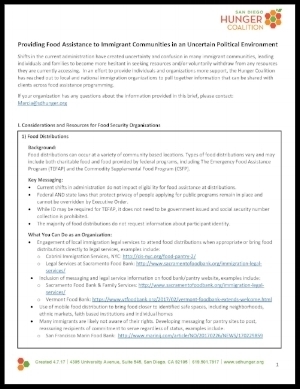 This brief provides information and links to additional immigration sources for food distribution centers, school and youth meals, CalFresh and WIC, and nonprofit organizations as well as legislative policy resources and considerations and resources for clients. It has been reviewed and vetted by the ACLU of San Diego and Imperial Counties. Everyone living in the U.S. has certain basic rights under the U.S. Constitution. Undocumented immigrants have these rights, too. It is important that we all assert and protect our basic rights. The National Immigration Law Center provides its Know Your Rights card in English, Spanish, Chinese, Arabic, Farsi, and Somali. The Immigrant Legal Resource Center also has Know Your Rights "red cards" available on their website. There has been a lot of recent confusion and updates surrounding the DACA program (Deferred Action for Childhood Arrivals). While DACA recipients are not eligible for CalFresh (but other household members who are US Citizens and/or Legal Permanent Residents could potentially be), we are sharing the updates we receive from our partners about the DACA program that may be helpful for immigrant communities and clients seeking food assistance. Visit National Immigration Law Center's website for the latest updates on DACA. Below are additional resources to help you understand your organization's rights and the rights of your clients. While some of the fact sheets are a few years old they are the most current information available on the rights of immigrant families and food assistance programs. We will continue to update this webpage as we receive more information. If your organization has any questions about the information provided in this brief, please contact: Marcia Garcia, CalFresh Coordinator at marcia@sdhunger.org. The U.S. Government wants to ensure that you receive food assistance if you are eligible under the CalFresh (food stamp) Program. This nutrition program of the United States Department of Agriculture is meant to assure the health and well-being of you and your family. El Gobierno De Los Estados Unidos quiere asegurar que Ud. recibe la asistencia de comida si es elegible bajo el programa de CalFresh (Estampillas de Alimentos). Este programa de nutrición del Departamento de Agricultura del Estados Unidos es para asegurar la salud y el bienestar de Ud. y su familia. Click here to read the issue brief from The Henry J. Kaiser Family Foundation.